I should preface this by saying that I'm not sure if you would consider me "moderately to heavily tattooed and pierced"; but I only got started a few years ago, and don't plan on stopping any time soon! As much as I love the experience, it is important to me to plan the resulting work of art, so that I end up as a single unified piece rather than a patchwork of images all different in style and meaning. So as I only have so much skin to cover, I am pacing myself by only getting one tattoo done every year to year and a half. 1. How did you get your first tattoo/piercing? Be very specific. Well, my first piercing was the standard ear piercing at the age of 10, which was a horrible experience and I swore I would never get anything pierced again. I assume, though, that you're asking about the first not-totally-mainstream body mod, so I'll fast-forward 14 years to my first tattoo. I am an artist, and as such the idea of making my artwork a permanent, visible part of my body had always appealed to me. When I finally came up with a design and placement that I liked, I went with a friend (who had gotten a tattoo at this parlor before) and we both got ink done. 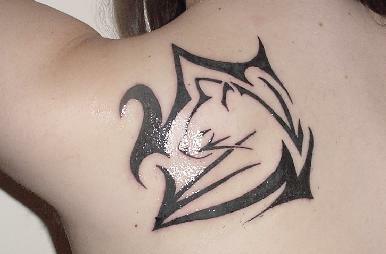 Mine was a tribal cat, about three inches square, on my left shoulder blade, and took an hour and a half. It was both worse and better than I expected; it hurt more, but I bore the pain better, than I had expected I would. 1a. When people ask you: "Why do you have so many tattoos/piercings?" what do you tell them? My joking answer is: "practice for childbirth!" But in the joke is the seed of the real answer. Many things very much worth having take an ordeal to acquire, whether it be a child, a PhD, or a tattoo. 2. Did you ever self-injure, and how? (and I don't want to limit self-injury to the now popular topic of "cutting" with razors or glass, though that certainly counts. I myself picked and scratched my skin, or beat my head or wrists against the wall). I had several episodes of severe depression from middle school through my early twenties, but it never resulted in self-injury. 2b. If you did self-injured in the past, has this pattern of self-destructive behavior begin to stop or change once you started tattooing/piercing your body? The depression has pretty much gotten under control, and in the same general time period as I have been getting tattooed, but I view those more as parallel processes of awakening to and discovering my core self, than one causing the other. 2c. Tell me about the pain of getting tattooed/pierced. How do you experience it? I.e., is it pleasurable, unpleasurable, emotional? It's empowering more than anything else, I think. It's pain that I can control and channel, which lends me strength to deal with things in day-to-day life. 3. When you get stressed, do you have an urge to tattoo/pierce? Tell me about your experience with the process of tattooing/piercing, from beginning to end, paying close attention to how you feel as you are being tattooed/pierced -- as you are in pain. These are really two very separate questions. 4. Finally, I'd like a history of your tattoos/piercings and what they represent. If you could include pictures, that would be fantastic. This being my first one, I was very conscious that this was something that would be on my body for the rest of my life, and so wanted to make sure it was an image that represented something that truly was at the core of who I am. I have identified with cats literally for as long as I can remember, and at 24 I could be fairly sure that that wasn't going to change, though everything else could and quite probably would. The tribal style was a hallmark of the type of artwork I was doing at the time (and still do, though I have branched out a bit). It is a bit harder to explain than the first without going into a detailed explanation of my religious philosophy (an obscure one I never expect people to have heard of - Thelema); but suffice it to say I meant it to mark myself as an adherent of that philosophy, and remind me of my core beliefs when times get hard. The design is an adaptation of my business logo (www.fireseastudios.com), which in turn was designed with my philosophical and artistic beliefs in mind. Its placement, over the base of my spine, also was meant as a sort of consecration of my body in preparation for having a child. Finally, an additional note on the motivation behind getting tattoos. I do have ADHD (attention deficit hyperactivity disorder), which frequently causes people to seek out intense experiences of all kinds - extreme sports, mind-altering chemicals, and body modification all fall into this category. While I don't consider myself a slave to this drive by any means, it's definitely there, and probably a little more so than for most of the population. Intense sensations, whether pleasurable or not, wake my mind up, pull it out of the fog of mundane existence, make me feel more alive. The nice thing about tattoos as opposed to things like skydiving and rock-climbing (both of which I also love doing) is that you have a pretty picture to take home afterwards!